On July 6, 2011 forty international educators gathered at Trinity Evangelical Divinity School for a three-day consultation on Pedagogy and Multinational Classrooms in Theological Education. Educators came from four primary continental areas (Asia, Europe, Africa and Latin America) and from schools in North America that share Trinity’s concern and commitment to making their institutions hospitable learning environments for students who must cross international boundaries to study. In addition, these two groups of professional educators were joined by pastors from multinational churches in the Chicago area who considered the implications of the critical issues being discussed for today’s multicultural, urban churches. A group of 15 graduate students from TEDS (most of them PhD students) attended as official “observers,” though all of them are professional educators, well able to give input from their rich experience leading and teaching in schools around the world. The three-day gathering, designed arou nd the World Café model of Juanita Brown and David Isaacs, was more of a consultation than a conference, as intense discussions took place around tables where participants considered the issues and designed interventions to address the real-life challenges with which they contend. On the opening night Dr. Jeffrey Greenman of Wheaton College set the tone for discussions as he spoke on the Globalization of Theology. Over the three days, participants discussed strategic issues in four facilitated sessions and informally around the lunch and dinner tables. The consultation was the final phase of a two-year research project funded by the Carl F.H. Henry Center for Theological Understanding called Globalizing Theological Education: Developing Pedagogical Practices to Enhance Teaching and Learning in Multi-National Learning Environments. The two-year project, under the direction of Dr. Miriam Charter, Director of the PhD/Educational Studies program and three PhD/Educational Studies students at TEDS (Cheryl Guth, Felix Theonugraha and Cesar Lopes) attempted in its initial phases to examine the multi-national learning environment of Trinity Evangelical Divinity School. The consultation in July enabled the research team to extend their research beyond Trinity to like-minded schools across North America and to theological schools in Singapore, the Philippines, the Ukraine, England, Chad, Kenya, Guatemala and Paraguay. Many other nations were represented by the PhD students who participated. In all, 18 countries were represented. For three days intensive discussions were engaged about the challenges that arise when students and faculty from many nations share the same learning environment. The research team’s purpose was to extend their data beyond the TEDS environment to settings around the world where students and faculty cross international boundaries to engage in theological education. 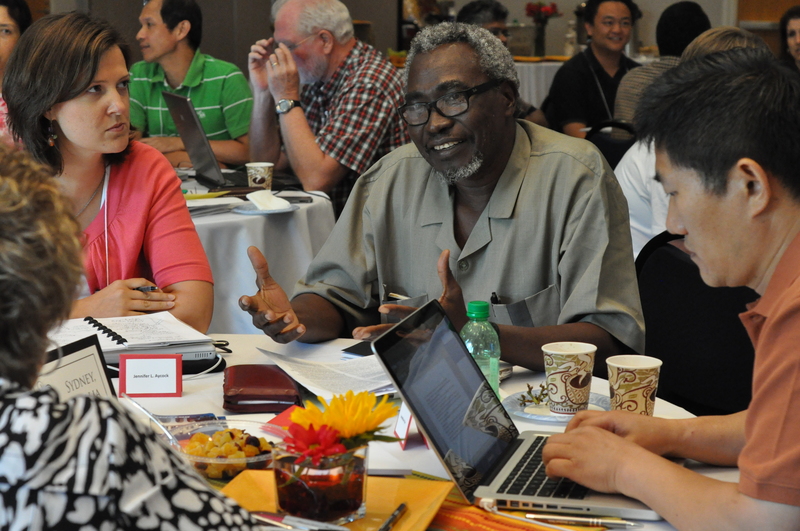 As discussions took place around tables, participants realized that many of the challenges revealed in the original report (from TEDS) were shared by theological schools in other parts of the world. Participants also realized that although there is significant literature on the issues of multicultural/multinational higher education, there are other issues that emerge when the focus of education is on theology and/or ministry training. Issues of contextualization arose and were engaged at length. On the final day participants spent the morning in brainstorming sessions as they discussed how educators might respond proactively to the challenges they face in multinational classroom settings. The day ended as participants considered a model (a Christological paradigm designed by Felix and Esther Theonugraha) within which educators might effectively consider their stance as either “representatives” or “advocates” for international learners. It is anticipated that from this inspiring gathering will emerge further reflections, written by the research team and by the participants of the consultation. Repeatedly, participants voiced their appreciation for the Henry Center’s willingness to fund research in issues that will have long-lasting implications for theological education around the world.